When we set out to search for what we dreamed would become our home on the sea, there were a number of key features that were important to both of us. 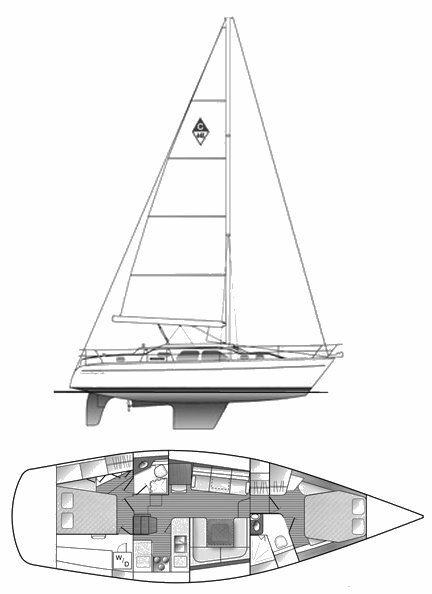 Neil’s sailing experiences led him to love monohull boats, and our preference was for an aft cockpit. Aesthetically, we desired a pilot or a deck saloon to allow in as much light as possible down below. We wanted at least two berths, as we anticipated that our boat would become our home for the foreseeable future, and we wanted room for loved ones to make memories with us (and for children to join our lives eventually). We were well-aware that the cost of refitting a boat from its barebones would cost more than we could save in the timeframe we hoped we’d be able to set sail. As a result, we also wanted a boat that was already equipped with solar power and, ideally, a watermaker. In The Red Thread, we found everything we hoped for and more. She had been maintained lovingly and diligently by the prior owners, The Maddox Family, who had sailed her over 40,000 miles around the Pacific during the prior five years. 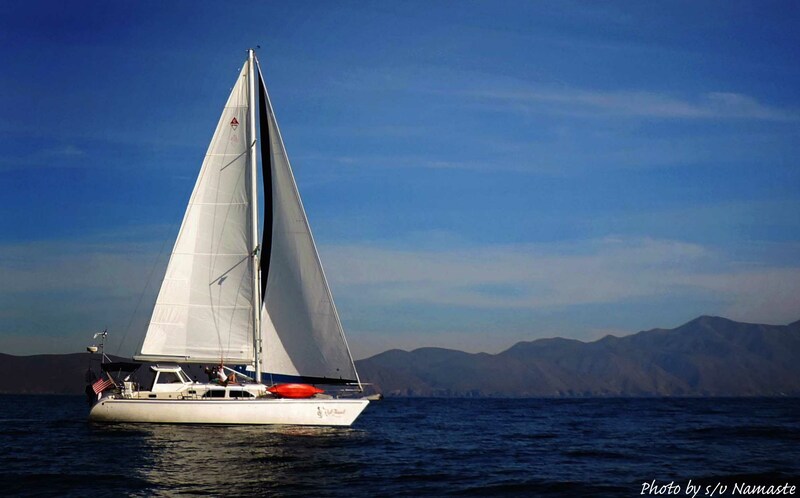 She is a tried and true cruising boat, and she was outfitted and ready to return to blue water. In addition to the practical features that were important to us, The Red Thread felt different than other boats we’d seen. Cliché as this might sound, her walls rang with the sounds of a family’s laughter and there was an energy that overtook both of us from the moment we stepped aboard. We knew she was more than just an incredible boat, she was a home. We fell for her immediately and she became ours on May 25, 2012. Neither of us had ever owned a boat before, and 44 feet felt enormous! Nonetheless, we agreed that if we were to chase our dreams of an ocean crossing in the coming years, we needed to purchase the boat capable of seeing that goal to fruition now and get to know her inside and out, rather than starting with a smaller vessel and working our way up. Although we both believe strongly in the power we each have to build the life we dream, we also feel strongly that certain people are meant to cross paths as they weave the story of their lives. The Red Thread was the name given to our boat by her prior owners, and it felt right to keep her name as we became part of her story. After she became ours, we asked our good friends, Arjay and Chad, to design a new logo for her bow. The symbol unifies our love for our home port, the world, and the oceans. The lovely crew of The Red Thread. Ah yes you know how to make even the smallest amount of time seem like the best time. Now, we get to see your amazing blog showing off the many talents of her owners who really know how to bring people and places together in a very memorable and meaningful way. Hard to believe it’s more than two years since you committed to this journey and now you are on the doorstep of something that is sure to define you for years to come. I can’t imagine either of you getting any better, but I can’t wait to hear all about it. Thank you and love you. Thanks, Glenn, we love you and The Gaggle right back! In The Red Thread we gained so much more than just a boat, as I hope our words above convey. You and your family are truly among our dearest friends, and I think the relationship we’ve built is a testament to the lore of the red thread. Just found your blog/fb page – LOVE the story of the red thread! Now I have to go catch up on all of these posts! Hello, from Marilyn and Steve (s/v Toccata). We met you in Elliott Bay Marina when we were there to take Steve to The Palisades for his birthday dinner. We shared the dream of cruising, just as you are. You are a year ahead of us. We both are going to “retire” the end of May. Our plan is to do a shake down cruise to Alaska for two months with friends in June starting from the Jeanneau rendezvous in Bedwell Harbor, Canada. In August we will do the Coho Hoho, the Baja Haha and eventually the Pacific Puddle Jump. We are frantically scrambling to get everything in order to take off. We will be following your blog to learn from your adventures. How did you choose a blog? I’m ready to set that up but don’t know which one to use!